Former premier Neville Wran officially opens Westmead Centre on 10 November 1978. Westmead Hospital officially opened its doors to the public on 10 November 1978. Forty years later, Westmead Hospital has evolved into a world-class tertiary and trauma centre, with a multi-million dollar redevelopment underway. To mark the 40 year milestone, general manager Brett Thompson has invited the community to celebrate the hospital’s birthday on Saturday 10 November from 10am – 3pm. “Join us as we celebrate our 40th birthday with a community open day at the hospital,” Mr Thompson said. 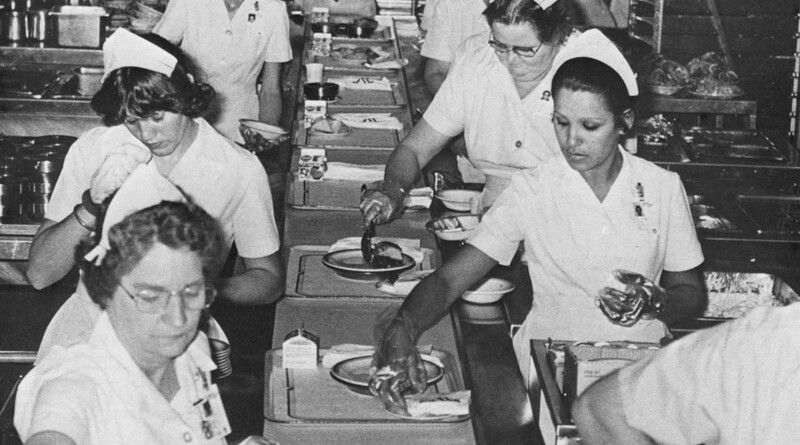 Food service assistants prepare patients meals at Westmead Hospital in 1979. “Visitors will be invited to step back in time with displays of memorabilia including nursing uniforms from the 1800s to 1980s, historical dental equipment and medical items on loan from the Powerhouse Museum. “Some of our longest-serving staff will give a glimpse into the early days of Westmead, covering everything from the 70s décor to the social club,” Brett said. First Westmead Hospital patient Mrs Queenie Murray with the then assistant director of nursing Sue Burgess and charge nurse Valda Morris. RSVP or registration not required. Entry is free.